Back in April, my oldest daughter Abby had a Dermatologist appointment, where we discovered that her Morphea had spread. Morphea is a type of Scleroderma, and is very rare. It’s a skin disease that so far, is only affecting her skin. Worst case scenario, it can affect her tissues and muscles and can cause deformity. So it’s quite serious. At that appointment, the Dermatologist had told us that he was referring us to a Rheumatologist, who was “more familiar with treating children with high-dose Steroid medication”. A little about me: I hate most modern medicines. I avoid Antibiotics at all costs. I had all three babies naturally. I rarely even take a Tylenol, and I think people who take cold medicine are crazy. And the one medicine I dread and avoid at all costs is Steroid medications. Abby needed a steroid to help her breathe once when she had croup and I lost my mind. But yes, breathing was pretty important. Oh, and I should mention here that I’m married to a Paramedic. Mr. Medical. Mr. Medicine. Mr. “we should put some polysporin on that paper cut so it doesn’t get infected”. 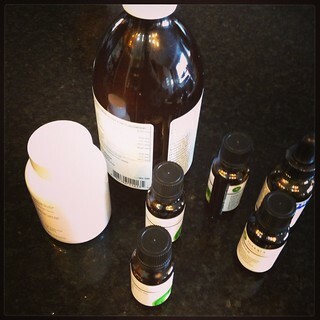 So, the day we were told that a Rheumatologist was our next step, I called a Naturopath. For the next 7 weeks, we put Abby on a crazy diet. No sugar, no dairy and no grains. No GRAINS! Not even gluten-free grains! She couldn’t even have grain-fed meat. It had to be grass fed. We bought meat that we had to pick up out of the back of a pick up truck in the mall parking lot. Almost contraband. I paid $35 for a chicken. A chicken that would normally cost me about $12 at a grocery store. I became very familiar with the Farmer’s Markets. I familiarized myself with the Paleo websites. I spent tons more money on Almond flour and Coconut Oil, trying different recipes that she would enjoy. There were also drops, vitamins and supplements. But it was also a HUGE education. Which I’m grateful for. Ultimately, we ended up letting her cheat for more days than we had her eating properly. And she wasn’t getting enough energy. She was tired and weak. Although, I do have to say that this diet did WONDERS for her attitude. She was like a different kid. Maybe it was because she was too weak to fight & argue. But we saw no improvements to her Morphea patches. It hadn’t spread, but would it have otherwise? This week we met with the Rheumatologist, For 3 hours. It was our first ever trip to the Alberta Children’s Hospital, and everything I’ve heard is true. Ahhhh-mazing! For the first time, EVER, I felt like they really cared about my questions. The doctor didn’t have her hand on the doorknob while I squeezed another question in. There was a TEAM of people who were there to answer questions. The gave me a BINDER of information. A direct phone number to call if I thought of a question later. Secondly, the Rheumatologist told me she has ‘lots’ of Morphea patients. I was so surprised by this, as I thought the disease was way more rare than it is. But so many patients get funneled to this hospital, so she knows her stuff. She also trained at the sick kids hospital in Toronto, where they had a Morphea Clinical group! Um…sold. She has seen the drugs work. She has seen great success in only 3 months. So, I sold out. I’m going against everything that I preach. But, I tried the natural way. So I feel good about that. I’m a huge believer in ‘Everything happens for a reason’, and I believe that the 3 month wait to see the Rheumatologist happened in order to give me time to try an alternative method first, so I would feel batter making this decision. Now, the Naturopath’s ‘concoctions’ (witch’s brews) are being replaced by Methotrexate. Yep, that’s the Chemo drug. She takes 5 little pills every Friday, that might make her sick. Or they might not (positive thinking). In addition to that scariness, she has to get her Steroid medication intravenously. At the hospital. So for three consecutive days every month, she will have an IV in her arm for 4 hours. We’re hoping to only have to do it for 3 months. Hopefully that will be the end of it. But please don’t think she’s a sickly little thing. She’s currently doing 20 hours of gymnastics training a week. She has the strength and determination I could only dream to have. At this moment, she’s doing aerials in my Bonus Room. Click to see video on Instagram. It’s been a year since Abby started her IV Steroid Therapy and Methotrexate. After 3 months of the Steroid therapy, her spots were a lot better. The skin was softer, and the purple rings had become brown – which means they are ‘inactive’. The IV part of the therapy was not fun. She hates needles, and had to get blood tests every month, and continues to do so every 3 months, and the Steroids made her feel gross and miserable. Pretty ‘icky’. Fortunately, that was only for 3 days a month for 3 months, and is a distant memory already. The Alberta Children’s Hospital was amazing,the entire Staff blew me away. Every day we went in, there were crafts planned for Abby and her brother & sister, lots of smiles and the best Nurses ever. She continues to take Methrotrexate every Friday, and will for an undecided amount of time. Her Rheumatologist has seen patient’s Morphea become active again after going off of it, so we’re just going to continue. If we stopped, and they became active again, we’d have to start over with the Steroids too, so it’s easier to just continue. Abby has zero side effects from the Metho, as long as she takes her folic acid. I couldn’t be happier with the results. Her spots are way less noticeable, and she even wears tank tops around her friends now, which she didn’t do a year ago. My daughter hasn’t been diagnosed yet, we are going to do a skin sample shortly, but it is looking like it is also morphea. I found your blog googling morphea naturopath. The freaky thing is she is 13 and also a gymnast! What the heck! I am wondering if you have other blog posts about this or if you have found any good reading. Thank you, hoping for the best for both our girls. I’m wondering, a year later, how your daughter is doing. My daughter used light therapy, but I want to be prepared to use methotrexate, if the disease comes back. Thanks! Hello! My name is Ellie and I was diagnosed with morphea 13 years ago. Originally, it began on my thumb and the side of my stomach. It was white and shiny. My dermatologist treated me with UVB rays and prescribed lotion. I did so for 6 years and recently started the lotion again. Today, my morphea has faded to a dark tan and is covering most of my right arm, right collar bone, thighs, sides of my stomach, right side of my face, shins, and the top of my feet. More than anything I hope your daughters refuse to let morphea define their beauty. I am continuously asked “what is that?” To save a long explanation, I usually say that my morphea is a birthmark. People understand that. Honestly, I never think about having morphea. It’s part of my body and I deal with it. Everyone has something…morphea really isn’t that bad. If you have morphea, you are one in a million. Litterally. How cool is that?! If you, your daughters, or anyone reading this has any questions or concerns, feel free to contact me! I wish your daughters the best of luck! Never let morphea define who you are. And remember, your beautiful daughters are one in a million. I’m rooting for them! Thank you for posting this, it is comforting to hear your story . I am similar in that I do not like giving drugs to my daughter and just connected to Naturopath for my daughters diagnosis of Linear Morphea but after reading your blog I may have a change of heart and start the Methotrexate . I know its been a few years since you last posted wondering if you can update me on your daughters outcome with treatments . I also find it interesting that we have several gymnasts in same age group with Morphea . Unfortunately, Abby’s Morphea has just returned. In the beginning of July we found 2 more spots, this time on her thighs. She has started the IV Steroid Therapy and Methotrexate again. She was off Metho for almost a year. I believe that the resent spots are because of a highly stressful gym season. This season we will be trying to help her find better coping strategies, as she is a very anxious kid, who puts a ton of pressure on herself. Thank you for responding, Your daughter is like mine who also carries a lot of anxiety and s also a gymnast 20 hours week at gym , Hmm odd that that a 3rd person on your blog also has daughter gymnast . My daughter will be 13 yrs old next week . So the methotrexate essential is only a medicine to mask the symptoms and we need to find the underlying root of cause. I am wondering if both a naturopath western medicine approach should be coupled in the process . Hi Shannon- my daughter was diagnosed in 2012 when she was 14, also a competitive gymnast training 20 hours a week at the time. The dermatologist she saw pretty much told her not to worry about it, prescribed vitamin D and sent us on our way. It did grow a fair amount in the first few months but then went dormant until now. In the last couple of weeks it has flared again and become very itchy and rashy. Since we are in Alberta as well, I wonder if you would provide me the name of the dermatologist Abby saw so that we can ask for a referral to someone who is familiar with morphea treatments. Thanks for sharing your journey! We see Rebeka Stevenson, a rhuematologist at ACH. There`s also a derm at the Market Mall Professional building who is a specialist. His name is Dr Prajapati. My 10 year old son was diagnosed at age 5 with Linear Morphea. It left a deep scar at the crown of his head but didn’t progress from there. I’ve noticed that he has a scar now forming right by his eye and there is a disformation. I’m so scared because I’m exactly like you. I’m terrified of medical intervention. My mom passed away from too much medical intervention so it’s left me swinging too far away from it. I’m thankful to read this as I live just outside of Calgary now so I’m happy to here the rheumatologist here is so great. I’m really terrified. I’m thinking our move here two years ago triggered him. We did do elimination diet too but it became too much. Thanks for your post. I’m really really bad at going the medical route. But I may have to. I developed morphea sclero following radiation for breast cancer. Stress seems to cause the morphea to grow and become painful. I use therapeutic essential oils (peppermint and ginger) for pain/ inflammation relief. It has stopped spreading but the discoloration remains.